A mother-of-five with terminal cancer who was fundraising for life-extending treatment has died. Karen Land, 41, was diagnosed with aggressive breast cancer in 2017 and said having immunotherapy treatment in Germany could prolong her life. 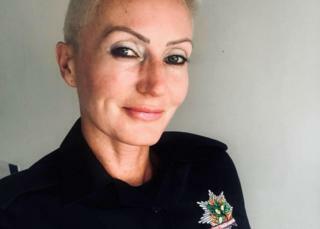 The Nottinghamshire firefighter set up a Facebook page to update thousands of supporters throughout her illness. Her mother Susan Harvey posted on Tuesday to share news her daughter had "lost her fight with cancer". Ms Land, from Retford, was given months to live as her triple negative breast cancer spread to her lungs and brain. The £100,000 treatment in Germany was not available to her on the NHS, and she raised more than £60,000 across two JustGiving pages. On Friday she posted on Team Karen Land that her condition had "deteriorated quite rapidly" and was in a hospice. "I've fought and fought this with everything I've had and will continue to do so but it looks like I am losing the battle," she wrote. Ms Harvey wrote on Tuesday: "I appreciate everything everyone has done for Karen in supporting her through her fight." Ms Land had previously said her mother would take care of the funds raised, and if she died before having treatment, anyone who had donated could decide what to do with their money. In January, an anonymous card was pushed through Ms Land's front door with "stop begging for money" written inside. It added: "What will happen to money when there is no cure 4U?" Ms Land said in response: "I won't apologise for trying to do everything I can to be here for as long as possible for my children." Tributes have flooded in on social media, including from Rebecca Smith, who wrote: "Karen your journey started out with your plight for basic survival but, whilst a whole town mourns we need to remember the magnitude of the legacy your journey has left." Jill Dukes, added: "You changed the mindset of everyone, your inspiration and fighting spirit touched everyone and your whole world touched everyone x Sleep now my friend." Another came from her colleagues at Haworth Fire Station.